Having a strong & sudden need to go to the bathroom right away. The need to go to the bathroom too often, also called "urinary frequency," generally the need to go to the bathroom 8 or more times per day. 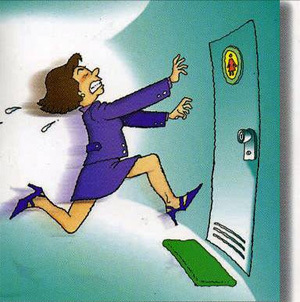 Leaking or wetting accidents, also called "urinary incontinence." Avoiding going out - weddings, holidays, events, public speaking, etc. How does Acupuncture & Herbal Medicine treat OAB? Proper treatment from a Chinese Medicine perspective involves finding the appropriate pattern(s) for each individual patient. The acupuncture points, techniques, and herbal medicines used will be focused around the specific patterns of the individual patient rather than being based on the specific condition of overactive bladder as it often is in western medicine. Individual pattern based medicine focuses on the root issues of the person which can then improve any number of individual health issues including those which the person may not have yet experienced (i.e. true prevention). The following list of related patterns are merely the most likely candidates when dealing with overactive bladder and incontinence, there are other causes and complicated cases may involved multiple patterns or complex relationships between patterns. My treatment process does not include drugs or unnatural hormones but does include gentle healing arts and lifestyle changes as may be appropriate. The information contained in this website is not intended to diagnose, treat, or prevent any medical condition.